My one Boris Berezovsky anecdote is that I once acted as page-turner at a recital he gave at the Dr. Anton Philipszaal in The Hague. At the brief pre-concert preparations there was a dauntingly huge ring-bound work by someone like Medtner. He took the score, said “of course, we won’t be playing all of this” and after a brief inspection, unexpectedly ripped out a huge wodge of paper from the middle. “Don’t worry about any gaps, I know it really…” That’s my kind of musician – I’ve been a fan ever since. Berezovsky’s great reputation is well earned, and he is now considered as one of the most powerful virtuoso pianists of his generation, as well as a musician with gifts of deep insight and uniquely personal sensitivities. Many of his recordings have been given the highest awards in Europe, and, like the back catalogues of other great pianists such as Martha Argerich, the time for adding a ton of marvels to your collection in one fell and not-too-costly swoop has never been better. Berezovsky’s Chopin is terrific – his Etudes warmer in expression but no less impressive than Mauricio Pollini’s classic Deutsche Grammophon recording of 1975. Berezovsky was only 23 when he made these recordings, but you wouldn’t take these to be the work of anyone other than in the prime of their artistic development. The Chopin/Godowski Études disc was Tony Hayward’s ‘Recording of the Month’ (see review), and this is indeed a staggering performance with that feeling of a unique and special event. The Chopin Études are well known, and executed with Berezovsky’s usual panache and musicality. These originals are then followed by their transcription, Godowski’s treatment as often as not making it sound as if the single pianist, brilliant and superhuman enough, has suddenly been transformed into more than one, sometimes a multitude of pianists. This Schumann disc is reviewed here by Christopher Fifield. I’ve come across some remarkable Schumann recordings in recent years, and of the Davidsbündlertänze that of Alessandra Ammara (see review) has been one of the most special. Berezovsky’s playing is no less expressive in this work, but isn’t quite as enquiring. Ammara seems to have a personal connection and narrative attached to every note, whereas Berezovsky is less deliberately poetic. His is a more overtly spectacular ‘concert-pianist’ view, but one with plenty of nuance and refined subtleties. The imagination is sparked, but the shapes are more of woods and glades rather than the complex fragrances and hidden thorns of an elaborate rose garden. Of the Piano Sonata No.2 in G minor Op.22 it is Angela Hewitt’s recording I’ve kept closest to hand as a reference. Berezovsky is again more masculine in his approach, though Hewitt is by no means any kind of softie. I can hear Berezovsky’s interpretation as an opera for piano – turbulent drama in Act I, followed by the tenderness of a soliloquy. Comic relief is palpable in the intermezzo which precedes the final hectic ensemble in which each character returns to say their piece, the whole tale concluded in breathless unity, a final magical revelation and betrothals all round. The Toccata is a showpiece in which Berezovsky is more than merely impressive, with every inner voice thrown forward with lightness of touch, and the whole with plenty of shading and transparency through the melee of notes. There are a few pretty staggering recordings of Liszt’s Études d’exécution transcendante around, and the names Claudio Arrau and Georges Cziffra are likely to pop up in any discussion of the complete set. The latter of these names falls under ‘historical’ recorded quality, and Berezovsky’s recording has to be one of the best around – squarely confronting even great achievements such as Leslie Howard’s Hyperion recording as part of their massive complete set or on CDA66357. The Teldec sound is effectively concert-hall in perspective though the Hyperion recording is set in an even more resonant acoustic; Howard’s playing, while terrific, giving the impression of being a bit more pedal-heavy. His melodic shaping is less convincing to my ears than Berezovsky, who still manages to sing triumphantly over something impossibly richly scored like the fourth Mazeppa etude. Transcending the technical demands of these pieces and creating genuine musical experiences with each is something we need, and Berezovsky’s playing is breathtakingly audacious as well as full of colour and imagination. I’ve not always been in love with this repertoire, but this recording has finally awakened me to its vast potential. This brings us more Liszt, and the two piano concertos. I bow in my lack of expertise in this repertoire to Michael Cookson, whose review of the Barenboim/Boulez recording is a rich resource of references. As part of such a richly rewarding set as this box I feel there is little to complain about in these recordings, though there are caveats. The piano balance sometimes drowns out the orchestra and is beyond realistic expectations. Berezovsky is however more distinguished than the Philharmonia Orchestra in both of these concertos, the accompaniment for which is very good, but too remote to whip up much excitement. Berezovsky’s playing is again tremendous: warm and expressive where it counts, and sharp as a needle with even the most technically demanding passages. If you are looking for this coupling in a more convincingly rich and unified picture and as a more expansive counterfoil to the intensity of the Teldec experience then Arnaldo Cohen and the Sao Paolo orchestra on BIS-SACD-1530 is as good a recording as any, though I will admit that Berezovsky is the more ‘alpha’ sounding of the two pianists. The Totentanz is excellent in this recording, grimly dark throughout, and pretty terrifying at the outset. The bonus track of Schubert’s Wanderer-Fantasie I can take or leave; Liszt’s vision with orchestra not really being an improvement on the original piano solo version, at times turning a white-knuckle ride of the imagination into something really rather corny, though the New York Philharmonic and Kurt Masur make a convincing enough case. Berezovsky’s vivid sense of drama and contrast suits Mussorgsky’s craggy Night on the Bare Mountain to the ground. His sense of the piercing chill of the howling and swirling winds is unerring, keeping a human element within the elemental experience but without let-up in that sense of danger inherent in a good performance of the piece. You would expect him to shine in an all-Russian recital, and the emotional turmoil of Rachmaninov is an assault on even Mussorgsky’s powerful statement. It’s not all butch power-playing, and the extremes of contrast in Op. 39 No. 7, Lento in C minor bring moments of Erik Satie-like simplicity against massive boulders of chords. Anatoly Liadov is a less familiar name, and the first two of the three Preludes here are lyrical and tenderly romantic. Medtner’s Fairy Tales are anything but child-like in aspect, and Berezovsky keeps a stern hold on the composer’s wonderful harmonic progressions no matter how many notes he takes to state them. Balakirev’s spectacular Islamey concludes a remarkable and immensely satisfying recital to which is impossible give real justice in one paragraph. This represents is another meeting of titans, and you would expect the Tchaikovsky Piano Concerto No. 1 to be something of a highlight of the collection. Very good it is indeed in parts, though the overall recorded sound is more warm and woolly than I expected – you keep wanting to turn up the volume to hear what’s going on, and finding out that this makes little difference. Martha Argerich’s recording has its own problems (see review), but with at times dodgy wind intonation and ensemble from the Ural Philharmonic Orchestra is still ultimately preferable. As a budget alternative I’ve rarely heard better than Nikolai Demidenko on Hyperion. It’s good to have the much less well-known Khachaturian Piano Concerto in D flat major, though the pungency of rhythm at times suffers in that woolly acoustic picture. Berezovsky’s solo part is urgent and fascinating and blisteringly intense. It’s when you compare this to the more vibrantly recorded though impossibly echo-bound Chandos version with Constantine Orbelian on CHAN8542 that you realise how tremendous Berezovsky’s performance is. By comparison you find yourself ‘waiting around for something to happen’ with the Chandos recording. This Teldec version isn’t a perfect recording, but is certainly a performance very much worth having. Less frequently performed than some of his other piano works but full of fascinating writing, Rachmaninov’s Variations on a Theme of Chopin is given a grand outing here. Opening with a broader statement than Idil Biret on her fine Naxos recording, 8.554426, Berezovsky is more abstract and poetic, probing as well as virtuoso. He misses out the 12th and 14th variations – something which Rachmaninov allows for in the score. The Piano Sonata No. 1 is also magnificent, symphonic in scale and ambitions, aspects of the music which Berezovsky reflects in a noble performance. 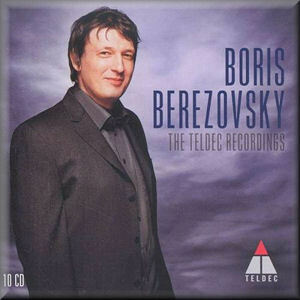 Referring to Idil Biret again on 8.553003, the Teldec recording obtains more clarity, and Berezovsky is less free with Rachmaninov’s phrasing and rhythmic integrity, giving us a greater sense of flow in general. His drive in the final Allegro molto is also more impressive. There are plenty of special recordings of Rachmaninov’s Piano Concerto No. 3 around, and the one which is paired with that Tchaikovsky recording with Martha Argerich mentioned on CD 7 is an old favourite. Berezovsky’s performance is even more large-scale, and whatever your reference might be, this is a deeply satisfying recording, with the Philharmonia Orchestra on top form - delivering sonorities and a passion which remind me of Tchaikovsky in comparison to the more Schumann-like RSO Berlin with Argerich/Chailly. The whole thing is given a startlingly vibrant recording. The timings between these two recordings are very similar, with Berezovsky only taking a good deal more time over the solo in the first movement to make his a good two minutes longer. The Op.23 Préludes which fill up the rest of the programme are all gorgeous, particularly No. 10 in G flat major, which emerges from nothing, like a gondola emerging from silent mists. This disc is ably described in Michael Cookson’s review of this all-Hindemith programme. As he concludes, this music should hold no fears for listeners less keen on ‘modern’ music. True, the counterpoint of Ludus Tonalis does demand a different kind of concentration, but Hindemith’s sense of tonality and clarity of melodic phrasing create some remarkable fugues, all expressed with appropriate vigour or expressive restraint by Boris Berezovsky. The earlier Suite ‘1922’ is a cracking piece, and full of that quirky theatricality of the period – classical music straining against the new influences of an age of machines and consumer dance music. Berezovsky’s touch is perhaps a mite heavy on occasion here, but there is no avoiding the conviction behind the notes. To conclude, this is a set not to be missed, though for some strange reason Teldec have opted to leave out Berezovsky's excellent 1994 Ravel disc which included Gaspard de la nuit and a remarkable La Valse - an omission to be lamented. The collection does have something of a bargain feel, with skimpy and generalised booklet notes and just the one photo for all disc sleeves. These are however made in sturdy cardboard, and come in a decently constructed clamshell box. rec. 23-24 February 2006, Philharmonia Great Hall, Ekaterinburg, Russia.